Maureen Johnson (or MoJo, as we like to call her) wrote a lovely novel, just released in paperback, called 13 Little Blue Envelopes, which has its teen heroine traveling through Europe on a very personal quest. Now she's got a new book out, Devilish. It's a YA take on Faust, complete with soul-selling, Catholic-school shenanigans, and other naughty & nifty twists. We think Devilish is delish, and so we asked MoJo to dish with us. Here's what she said. Christopher Isherwood, who wrote The Berlin Stories, as well as several other amazing books. Two always stick out. The first is The Westing Game by Ellen Raskin. I was completed obsessed with that book. The other one is The Twenty-One Balloons by William Pene du Bois. I must have read this when I was really small and I loved it. But then I couldn’t quite remember for a while if this was something I read or I dreamed . . . a story about people who live on an island full of diamonds, each family owns a restaurant, the ground shakes. I was describing it to someone years later, and they knew it instantly. So I ran out and got a copy, and it all came rushing back—the illustrations, the balloons, the restaurants and diamonds. I like a little noise around me, but not too much. And I don’t like to have too great of a view. I prefer tables to desks, so I can spread out my pages. My dream is to find some kind of coffee place that has decent tables, good music, and someone to watch your computer so you can get up and wander around. Do such places exist? I would love to know. 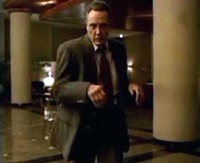 Theme song: I think I’d like “Weapon of Choice” by Fatboy Slim (the one with the Christopher Walken dancing video), because you need something catchy. Suddenly, my best friend (seated next to me) is seized by the Muse of Comedy and begins buzzing in my ear the single most hilarious commentary that I have ever heard in my life. I am trying not to laugh. Tears are running down my face. I claw at her leg and beg her to stop. She says she can’t, she’s been possessed. I hiss that we are about to get kicked out of the school after 48 hours, which has to be a record. She says she can’t help that. I start smacking her as much as I can without being seen. Nothing will stop her. I stab her with my pen. She only gets funnier. Blooper reel: Me, aged four, singing the song “Tie a Yellow Ribbon Around the Old Oak Tree” (as performed by Tony Orlando and Dawn) into the suction tube of a vacuum cleaner. So excited am I by this performance that I run around the vacuum in circles as I sing, then I trip over the cord and snap my arm in two. I was a smart kid. Veggie burger please. I’ll have mine with roasted red pepper, avocado, and Monterrey Jack. Pickles on the side. And all the condiments in the house. i didn't think anybody else knew about the Westing Game! great book. I didn't know there were more Patrick Dennis books after Auntie Mame. I love Mame. And I am going to go buy Twenty-One Balloons right now. Nice post. I also like Indiana Jone's hat. He was my hero when I was younger, I watched all his movies. I will buy "The Westing Game" and " The Twenty-One Balloons" to my kids, I hope they will enjoy too. Thanks for your blog!